Arnold Felcher Cake, Coconut Cake, cooking, grating coconut, Mennonite Recipes from the Shenandoah Valley, Recipes, Whatever Happened to Dinner? Why Bother with Fresh Coconut on Classic Coconut Cake? My husband’s Aunt Mary R., now she was a cook. I say was because even though she’s still living, she is not able to cook for herself anymore. But the great passion of her life—in addition to the husband she lost in the Korean War and never found—was cooking for family. I got the impression sitting down to her groaning table that she was the happiest when feeding a huge meal to others—frequently using her best dishes. Aunt Mary with oldest daughter, Michelle. I thought of her this past weekend as I made a coconut cake for a family reunion and recalled the time she drove from Montgomery, Alabama to visit us here in Virginia, all by herself and probably in her high seventies. She came with the goal of making several of her brother’s (my husband’s father, Hershal) special favorites including a barbecue sauce for pork, and a coconut cake. I wish I could say co-co-nut cake the way she does in her deep Alabama drawl. So for her coconut cake, she had to use a real coconut—never mind the work. I had never opened one before her visit, and until last Saturday, had never opened one since. But after I wrote (here) about making Mary Emma Showalter’s coconut cake (of Mennonite Community Cookbook fame), another Mary V. (hang on to your hats, this story is filled with Marys. Mary V., my husband’s cousin on his mother’s side), pounced on that post and proclaimed I had to make it for the family’s summer picnic. I squirmed, not anxious to repeat the three layer huge cake and Mary Emma’s arduous mixing process. I reminded Mary V. that it might go better for the Christmas get together but she hinted that ever since the older aunts stopped baking—and have all now passed on—the reunion had been missing its coconut cake. I told my husband what I was planning and he flinched only slightly: he wasn’t going to get one of my reunion mainstays, Arnold Felcher cake. 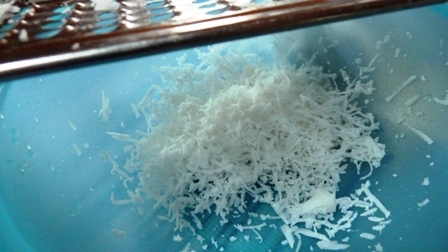 Finally I resolved to make the cake, but to look for another recipe and use freshly grated coconut. 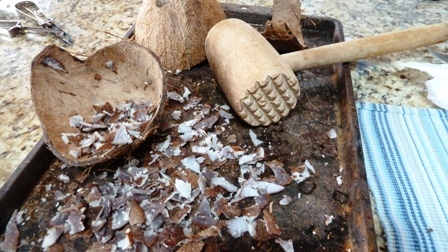 Might as well get the real “foodie” thing going: drill the hole; drain the milk; break open the coconut (not easy either); separate the coconut meat from the shell (ugh); scrape the brown liner off the white meat; and THEN grate the pieces into fine fluffy coconut. All of that took un-expert-me hours all by my lonely self (husband working), when I could have just opened a bag. But I was determined. So it wasn’t until I had gotten to the last step of slowly making my pile of fluffy grated coconut that I decided to sit down for the job. I flashed back 20 or so years to Aunt Mary’s visit and recalled how she had sat in my kitchen at the table grating that coconut while I went about my other chores. Suddenly she was with me in the kitchen—not in Aunt Mary’s charismatic religious way of visions and prophecies—but her love and spirit of pouring out her life for her family. 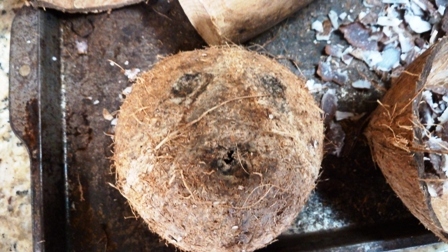 Each coconut has a face. Did you know? The facial features are the best places to make a hole. I reflected on how this was probably going to be the last time I would use a real coconut, grating and all, and how for anyone to do this on a regular basis—it would be a labor of love. The other truth that also hit me was that her making that cake was a true toil of love for her only living brother, for the memories of their mother, for family. Their family relationships were complicated to be sure—(aren’t most? )—but down beneath the connections ran deep. The things we do for love and family. Now coconut—fresh or otherwise—seems to be something you either enjoy or you don’t. 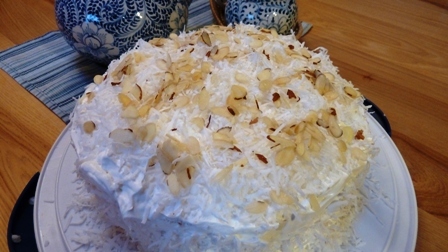 As some of us enjoyed the reunion cake, my sister-in-law Barbara said what it made her think of was grating coconut at Christmas as a family; her father would always drill the hole and dig it out of the shell and they’d all help grate and enjoy the fluffy stuff. All that to say, here’s a recipe that was easy and turned out perfectly. The nutty flavor of fresh coconut was a treat—and my husband and I enjoyed the cake even more a day later when we could eat it with a dollop of ice cream. But on this we agreed: we both like Arnold Felcher’s Cake a tad better! And if one of my grandkids develops a taste for real homemade fresh coconut cake, they might get me to do it again. Especially if they help. Adapted from recipe by Esther B. Rodes, (correct spelling) McGaheysville, Va. in Mennonite Recipes from the Shenandoah Valley, Good Books. Mix together sugar, flour, baking powder, and salt. Add shortening, milk, vanilla and flavoring. Beat for 3 minutes with mixer. Add egg whites and beat on high speed for another 3 minutes. Pour into 2 greased and floured 8 or 9-inch round pans. Bake at 360 degrees for 30-40 minutes. When completely cooled, spread whipped topping over bottom layer. Sprinkle with coconut. Place top layer on cake and spread with whipped topping. Add remaining coconut. Refrigerate. The cake is best if refrigerated for at least 6 hours to firm topping. What stories from your own family does this bring to mind? What dish or dishes do you make “for love” of family? Do you have a favorite coconut cake recipe you recommend? Find Mennonite Recipes from the Shenandoah Valley here. Another wonderful and now-classic Mennonite Shenandoah Valley cookbook is the 600+ page Mennonite Country-Style Recipes and Kitchen Secrets : The Prize Collection of a Shenandoah Valley Cook by Esther Shank, who also wrote an endorsement for my cookbook, Whatever Happened to Dinner. Hi Melodie! Thanks! I forwarded the recipes on to Barbara Strawderman, and put them in my own recipe file! Bev. Thanks for sharing the recipes. Awesome. I am not a fan of coconut and even though my husband is, I do not think I could even try this one as a labour of love! However I enjoyed every minute reading your story and fell in love with your Aunt Mary and her devotion to her brother and family.. So, not a fan eh? That’s ok. 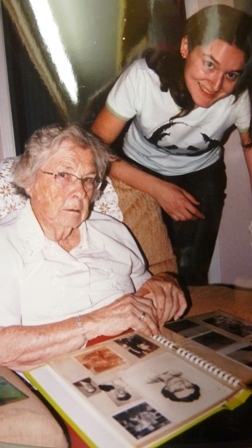 I love your comment about my husband’s Aunt Mary–you would love her too. Thanks for chiming in. We all like coconut and our favorite recipe is from the red Betty Crocker cookbook…I can’t find a copyright date, but I bought it new in 1980. We make the German Chocolate cake recipe, a 3 layer sweet chocolate cake with coconut pecan frosting on the layers and top and glossy chocolate frosting on the side. It’s delicious. I made one last Thursday night for company dinner on Friday. Our second favorite is a coconut cream pie, a recipe from my oldest girl. She found it on the internet. I keep a jar of unsweetened flaked coconut that I buy in the bulk sections. We like to sprinkle that on curry dishes and add it to zucchini bread recipe. We never use fresh coconut. I noticed your recipe asks for coconut flavoring…that is artificial. Also cool whip, also artificial. As such, I would certainly use Baker’s coconut as an acceptable choice. But I fully understand the obsession of using certain ingredients and the sentiment and nostalgia attached to them. Melodie, not everybody likes to cook or bake to the same degree, that is for sure! I always keep the smallest size of cool whip in my freezer for a green pistachio fluff salad. I am not averse to using it for that. I did think, as you did, that using the coconut milk would be a better choice…I have a problem with artificial ingredients…since I have an auto immune disease I try to keep things as close to nature as possible. I am better at baking then cooking, though I do love to cook. It never seems a chore to me. But by the time I was in 4th grade my grandma started me making all the quickbreads, coffee cakes, kuchen, muffins…that type of thing. When I was very young she still was using her cast iron range, with it’s hot water reservoir and her endless kettle of soup and pot of coffee on the back burner. She had a lovely gas range that her children all bought her and but she was stubborn. The house still has both stoves in it…the gas range works great. I wish I could think of a cooking story, but cannot. But a dish for love…oldest girl just the other day asked rather apprehensively…”do you think you could make that lemon-blueberry cake again this year for my birthday? 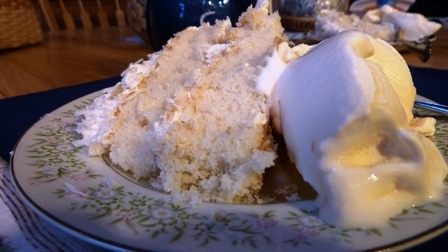 ?” It was delicious, but a baking ordeal…with lemon cake, lemon filling and lemon frosting. Of course I said sure. Everyone gets to pick their cake if I am making it, which is still most of the time. You have shared some marvelous stories and family memories here; just last evening I interviewed a young girl, 12, who began cooking with her grandmother, and like you, did the whole baking routine and has now branched into doing almost all the dinner cooking for her family of four. Just amazing. I will share her story and some of her methods in weeks to come! I guess it wasn’t so unusual “back in the day” for a 12 year old to be doing most of the cooking but it is a little unusual these days! Sweet to hear of your granddaughter’s request for her lemon-blueberry cake. Sounds interesting!